D E L I G H T S & E C C E N T R I C I T I E S. Eating for England is a personal and somewhat playful portrait of the British and how they eat. It is a collection of short, affectionate and occasionally mischievous essays about our relationship with food. Eating for England details our obsessions, failings and a curious assortment of culinary icons and makes the point that we have much to celebrate - from pork scratchings and afternoon teas to seaside rock and Jamie Oliver. Published in 2007, Eating for England is available in hardback, paperback and as an audio book. A five part play, inspired by this book, has been specially written for BBC Radio 4. Dramatised by Sarah Daniels and starring Celia Imrie as Aunt Elvie and Julian Rhind Tutt as Nigel, it was broadcast in 2015. 'New York, late autumn, and I have just taken the short walk from Central Park to Carnegie Hall, where I am being interviewed for a radio show. It's a bright, invigoratingly breezy day and I'm feeling confident. I know what I am to be interviewed about, and am pretty sure of my ground and even remain unfazed when, at the last minute, I find out that the interview is going out live. As I say, I know my ground. And then comes the question, the one I wasn't prepared for, the one where I am asked to describe British food to the listeners. Do I tell them about the meltingly tender lamb from North Ronaldsay, the famous apple hat pudding with its tender sute crust or the northern teacake known as the fat rascal? Do I have the time to enthuse about medlar jelly, damson gin and the undpasteurised cheeses made down long leafy lanes in Dorset, Devon and Dunmphries? Perhaps I should wax eloquent about Wiltshire bacon, sherry trifle, Christmas Pudding or steak-and-kidney pie with its crumbly pastry and savoury filling? Will there be time to get in name checks for Scottish heather honey, toasted teacakes, gooseberry fool and Caerphilly cheese? 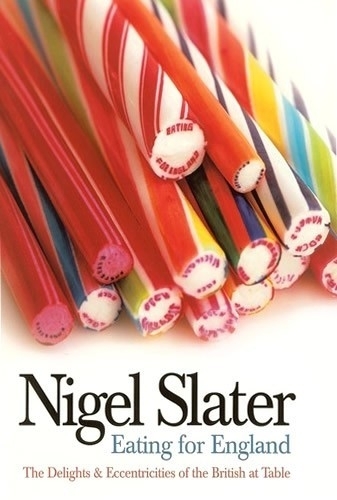 "Nigel Slater understands as well as anybody how to turn ingredients into a meal, but his big thing is his grasp of how a meal can turn into a new confection in the mind. For Slater, a meal isn`t just nourishment, it`s memory, nostalgia, excitements and heartache.... A wonderfully comforting book. William Leith, Evening Standard.